Condition This impasto oinochoe is conserved from numerous fragments. Significant portions of the vessel are missing and have been restored in plaster. 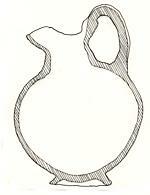 The preserved portion of the vessel displays a complete handle and base, a nearly complete neck, and portions of the spout and body. The surfaces of the vessel are heavily worn. This vessel preserves seventeen associated but non-joining fragments. Object Coordinate Notes Depth below surface for find #3 page 145: 299 cm. 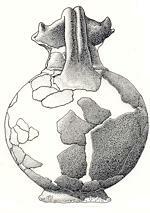 All fragments were recovered from the base of the Civitate A well.